After witnessing a mob hit, surgeon Jack Francisco is put into protective custody to keep him safe until he can testify. A hitman known only as D is blackmailed into killing Jack, but when he tracks him down, his weary conscience won’t allow him to murder an innocent man. Finding in each other an unlikely ally, Jack and D are soon on the run from shadowy enemies. Forced to work together to survive, the two men forge a bond that ripens into unexpected passion. Jack sees the wounded soul beneath D’s cold, detached exterior, and D finds in Jack the person who can help him reclaim the man he once was. As the day of Jack’s testimony approaches, he and D find themselves not only fighting for their lives… but also fighting for their future. A future together. 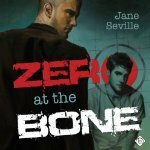 I remember when Zero at the Bone was all the rage among my reading pals. I was new to the m/m genre at the time, but I grabbed up a sample and got to work. Then I got to the part where D started talking with that awful southern accent and all hope was lost. I remember thinking: “surely this won’t go on for the entire book.” Yeah, I was wrong, so I dropped that sample like it was hot and Zero at the Bone went straight to my DNF pile. See, I don’t do accents when it comes to reading. Ever. Wait, that’s a lie—I was dazzled by Jamie Fraser in Outlander. But the other 99 percent of the time, forget it. I don’t care if a book has all the stars. I. Hate. Written. Accents. This was my very first audio book, and I give the overall listening/audio book experience 4 stars. I have a pretty hefty commute to and from work, so even though Zero was more than 13 hours long, I was able to knock out nearly two hours of listening each day. I liked the narrator, Alan Smith. His voice was even and soothing, and he drew me in from the start. I thought he nailed it with his interpretation of D, the rough and tough hitman, and I *mostly* liked how he played Jack, the witness D forced himself to save and protect. I thought Alan Smith’s Jack came off as a bit whiny and ungrateful, but maybe that’s how the author intended him to be? The remaining characters were well done and it was always super easy for me to know who was talking and what was going on at any given point (probably because of D’s accent, HA!). Length: 13 hours, 21 mins. This entry was posted on February 24, 2015 by Jenni in Contemporary, Dark & Twisted, Mystery / Suspense, Reviewer: Jenni and tagged 3.5 Stars, audiobook, Dreamspinner Press, Jane Seville.